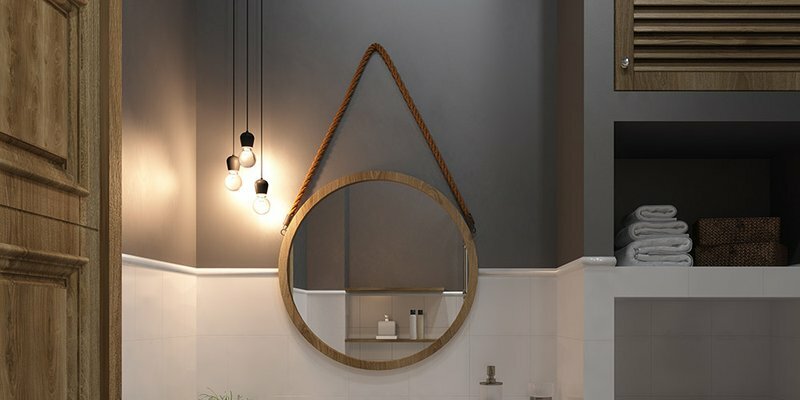 The bathroom is a space of balance. You can decorate this room to perfection but it also needs to be practical for frequent use. Plus it’s one of the most enduring rooms in the home, with functional fixtures that aren’t cheap or easy to change – nobody rips out their bathtub at the drop of a new trend! Yet the permanence of some elements doesn’t mean you’re stuck for interior design opportunities or need to spend a lot. You can refresh your bathroom on a budget. All it takes is a little imagination. 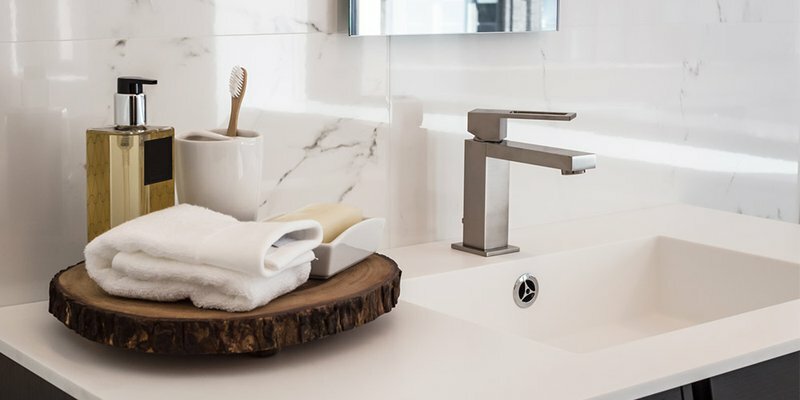 Tapware is one of the easiest things to update in a bathroom. These fittings are available in a whole heap of different styles and finishes. And changing yours can make a big difference. Ditch the ‘so yesterday’ silver for gold, vintage brass or something truly unusual. New tapware can make your fixtures seem brand new as well as really helping to ground the style you’re going for. 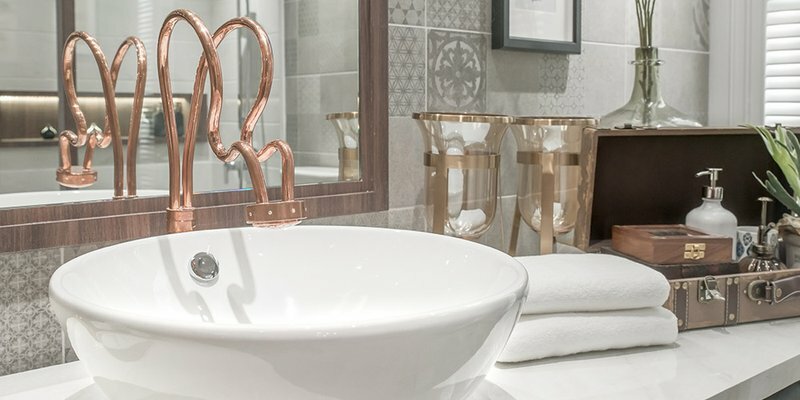 We’re currently in love with copper taps! Do you have anything dressing your bathroom windows? If not then you have a great opportunity to bring something more to your room. Even if you do have blinds up, consider changing them for a different look. 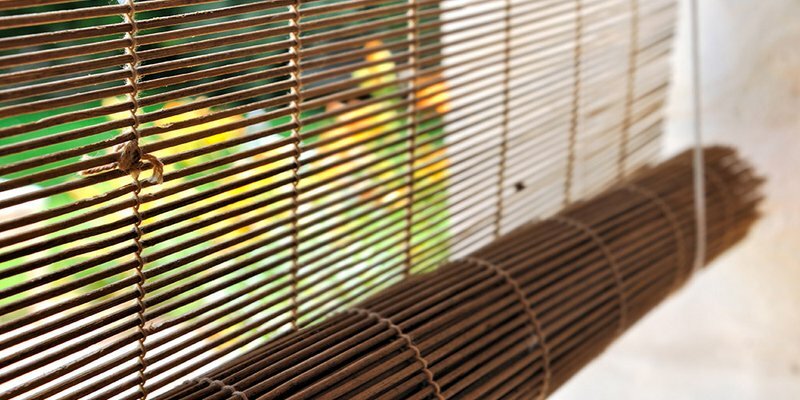 Natural colours and textures can add a homely touch while venetian blinds or shutters will make a lovely statement. Your window sills offer a great space for accessorising too. Add cacti or flowers to freshen-up the vibe. Window areas offer a perfect way to bring texture and interest into your bathroom. Is your soap dispenser looking grubby? Has your toilet roll holder seen better days? Renew your bathroom accessories for easy impact. Metals, jewel tones and wooden pieces are on-trend and can help to bring interest to different areas of the room. Changing your towels can also make a huge difference. Use these to add pops of colour or emphasise a neutral scheme. Roll up and place in baskets or on shelves to make them a feature. As bathrooms are usually small spaces, changing the floor can be low cost endeavour that makes a huge difference. If your carpet is looking tired or you have tiles that could do with renewing, consider vinyl flooring. This material is water resistant and stays warm underfoot so you won’t need bathroom rugs. That’s one less decision and less washing! Plus vinyl flooring is really easy to clean with a quick vacuum and mop every now and then. Opt for a wood or tile effect to bring a natural feel to the base of your bathroom without the price tag. It’s lovely to relax in the bath by candlelight. But what if you could get that cosy feel every time you step into the room? Consider additional wall lighting that creates a different feel to your bright overhead. Set a spa-like mood with dimmed bulbs. Every shower is suddenly more luxurious! Spotlights are great for highlighting specific areas of your room too. Place them near your vanity unit to bring some brighter light to this useful area. Find more home design inspiration on the blog.